Eliminate Full Price: First Mailbox Monday of 2012! Happy 2012 everyone! I know it's been a really long time since I've posted a Mailbox Monday entry. I will try my best to get back into the groove of posting the goodies I've received in the mail. Here what I received from October 24th, 2011 to December 27th, 2011. Not everything is pictured. 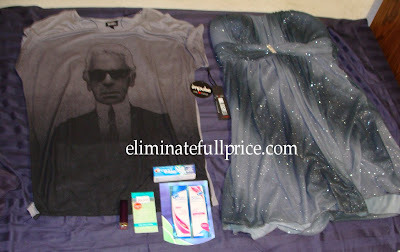 -Karl Lagerfeld Shirt from Macy's - I used gift codes I won from a contest Macy's had a few months ago. -Longchamp bag I ordered from bloomingdales.com - It wasn't free but I used coupons that helped me save over $50. -2 mechanical pencils I won from a contest on Facebook. 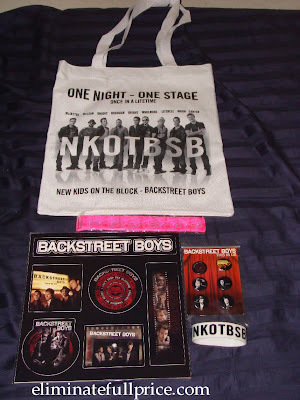 -Backstreet Boys merchandise I ordered with a $40 Livenation code. I paid $17.17 for a tote bag, stickers, buttons, snap bracelet, and NKOTBSB wristband. The value of everything is $50 without the code! I'm always happy to eliminate full price on Backstreet Boys related items! -Prom Dress for the Backstreet Boys Cruise - It only cost $22.60 with tax & shipping! The retail price was $89.00. Then I used a Macy's gift card my mom gave me so technically it was free. -iPod Nano - If anyone wants to buy it I'll sell it for $100 plus $5 shipping & handling. E-mail me at jocelyncontest (@) gmail.com. -Snapfish 16 x 20 poster print of my picture with Backstreet Boys from December 1st, 2011 in Miami, FL. The print normally costs $16.99 but I won a coupon code in 2010 & I finally redeemed it. I only paid $3.24 for shipping.